With violence an ever present threat in our area and our education exposing us to a wide range of cybersecurity risks, we were inspired to create a platform that empowers our community to safely report incidences that often times go unreported, and to guide them to the proper channels to positively impact our community though civic involvement and support. 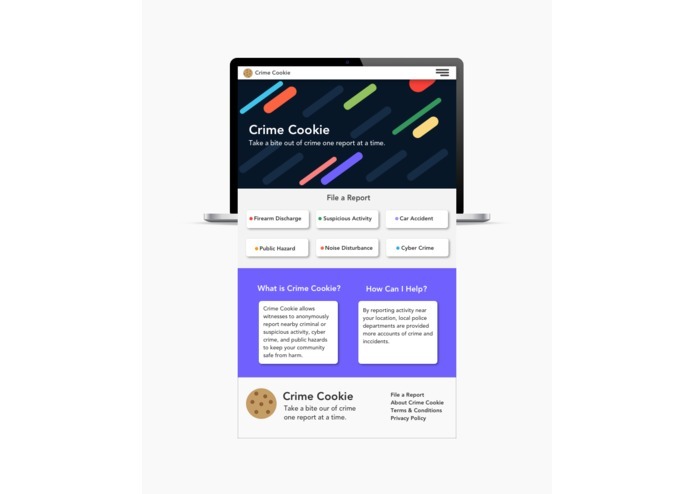 Crime Cookie is a witness crime reporting platform. We created this website to pull together the different local and national reporting, tip, and help services to try to solve the reasons these problems go unreported and uninterrupted, making our community and our online presence that much safer. By giving the proper authorities more information about the crimes that have occurred and enlightening them of ongoing situations, Crime Cookie could make a significant impact on the speed and accuracy of investigations. The overall impact is to increase social involvement and community safety. Additionally, cybercrime has become pervasive as our dependence on technology grows. Both businesses and individual users are impacted by the threat and risk of cyber attacks and crime everyday. Yet, a great deal of these attacks, successful or not, go unreported. This project overall requires a lot of time and we were not able to incorporate all of the fully-functioning features that we wanted within 24-hours. We initially wanted to develop a mobile application for Android; however, due to unavoidable constraints, we made the decision to change the platform to a desktop website. We are proud of having developed a website that approaches a relevant problem in our community. We also learned a lot about working as a multidisciplinary team and were able to complete a significant portion of the project in under 24 hours. During our time at Technica, we learned how to use HERE.com's mapping API, register a domain name on Domain.com, use a third-party vendor to facilitate account creation and login, and develop a static mockup in Sketch. We are excited about future possibilities for Crime Cooke. We are interested in developing additional functionality and expanding the reporting categories. We also want to release a mobile app version and implement interactive games geared towards educationing users about services in their community. I worked on the UI design of our website using Sketch. I also assisted with implementing CSS. 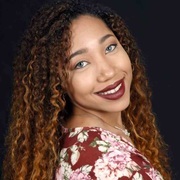 Senior Information Systems and Technology Major at Old Dominion University. I worked on the research and writing section of the application. Finding the contact information to send the reports to. I worked on the html and CSS on the webpage to give it more prettiness and presentable because it is the first thing anyone sees. I assisted with sharing ideas with Sabrina towards the designing and appearance.